The National Trust (NT) has launched a permanent online exhibition to highlight the work of Thomas Chippendale, following the Chippendale tercentenary celebrations, offering an opportunity to fresh and enhance knowledge of historic interior detailing and furniture terminology. 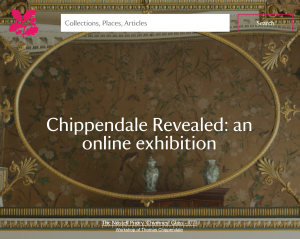 Chippendale Revealed, a permanent online exhibition, is the result of two week-long photographic shoots in the house in March and April 2018. Why did the Trust feel the need to re-photograph furniture that is already so famous (even familiar) and illustrated in publications by the 20th century’s leading Chippendale scholars? The time was right, we felt, to provide new views of some of this furniture, often seen behind ropes by visitors to the house, where a balance has to be struck between access and conservation. Where possible, Chippendale’s furniture at Nostell has been re-photographed in a studio setting, removed from rooms which, whilst beautiful, sometimes distract from the beauty of the pieces themselves. The result is a detailed and intimate record of some of the output from Chippendale’s workshop, which we hope will interest and delight enthusiasts and scholars alike.